It was a foregone conclusion of credible American military minds cognizant of activities in the Middle East and Far East during World War II that the Axis powers (Germany, Italy, and Japan) showed repeated intentions of expanding their territorial conquests in a converging direction from Germany to Japan, from the Mediterranean Sea and North Africa across Saudi Arabia, India, Burma, and coastal China. Such control of vital land and waterways rich in raw materials . . . would have led to the prolongation of World War II and even possibly altered its final result. Paperback. Douglas Southall Freeman (1886-1953) remains one of the greatest historians of the Civil War. His monumental biographies, including Lee’s Lieutenants and the Pulitzer Prize-winning R. E. Lee, combined intellectual fervor with meticulous research and a graceful prose style. He received a second, posthumous Pulitzer Prize for his six-volume study of George Washington, still the definitive work on the first president. Freeman’s literary accomplishments are all the more remarkable considering that he was also editor of the Richmond News Leader from 1915 to 1949 and made twice-daily radio news broadcasts. Hardcover. In 1937, Amelia Earhart and her navigator, Fred Noonan, vanished as the world watched. Speculation ran rampant, and most assumed that they had crash-landed in the ocean and perished. But did they? With more than thirteen years of painstaking international research, Dave Horner brings into focus Earhart’s final days. He minutely dissects prevailing theories, comparing them to evidence only recently uncovered. He presents an astonishing and well-documented conclusion that explains, once and for all, what happened to this beloved aviatrix. From early settler adventures to post-Civil War recovery, this account of Monroe, Louisiana’s history provides a timeline of the city from 1530 to 1936. Highlighting interesting events in Monroe’s development, this resource follows the locale from its beginning as a camp for explorers to a bustling city with fifty miles of paved streets. Memorable moments from the twentieth century include social, political, and economic developments. Some of the buildings described remained registered as National Historic Places in the twenty-first century. In the decade preceding the Civil War, New Orleans was a boisterous port with one of the most diverse populations in the world. But the city was enjoying a transient heyday, soon to be replaced by devastation and Reconstruction. Well-known Shreveport historian Eric J. Brock details the history of the city’s commerce, civic development, neighborhoods, architecture, cemeteries, peculiar events, culture, religion, and education. Based on his columns for the long-running weekly series, “The Presence of the Past,” which appeared weekly in the Shreveport Journal Page, it is the result of many years of documentation and research. Hardcover. Well-known Shreveport historian Eric J. Brock details the history of the city’s commerce, civic development, neighborhoods, architecture, cemeteries, peculiar events, culture, religion, and education. Based on his columns for the long-running weekly series, “The Presence of the Past,” which appeared weekly in the Shreveport Journal Page, it is the result of many years of documentation and research. The famed American Civil War general Robert E. Lee offers lessons on effective leadership in Mike Lipsey’s Ethical Leadership of Robert E. Lee. Paperback. Most images depicting the American Revolution are historically inaccurate nineteenth- and twentieth-century recreations. Historian Arthur S. Lefkowitz is working to change this. Lefkowitz gathered images from artists who were on-site for these pivotal moments in our nation’s history. This classic reprint evokes a city steeped in the traditions and idiosyncrasies of three cultures—French, Spanish, and American. Paperback. This classic reprint evokes a city steeped in the traditions and idiosyncrasies of three cultures—French, Spanish, and American. The thunder and excitement of the race has long drawn visitors to the Fair Grounds. 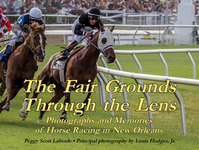 The history of one of America’s oldest thoroughbred horseracing tracks is chronicled here through text, rare photographs, and archival lithographs. First published in 1927, Father Mississippi contains accounts of those who lived their lives along the Mississippi River, and documents the first ripple in a wave of tremendous changes that took place in its environment. Over 70 years later, Father Mississippi still stands as an important history of the floods of 1927, most often remembered for their far-reaching impact on the cities along the Mississippi River, and the devastation they caused to towns in the southern Mississippi River Valley region. Paperback. Flying high above us and waving in the wind, flags are reminders of what we stand for. Every flag has a unique story. Those that survived the war are featured in this book with color illustrations and a brief history of their units. They are presented chronologically, and each flag is shown in its original design. Cavalry, infantry, artillery and naval flags are included, along with those that did not belong to any particular unit. Paperback. Throughout the course of the Civil War, Arkansas furnished sixty-five thousand men to serve in defense of the South, and each of the companies and regiments proudly bore a banner to represent their cause. In this painstakingly researched study of Arkansas Civil War-era flags, the author presents a stunning history of the Civil War in Arkansas as told through the state’s company, battle, and regiment flags.